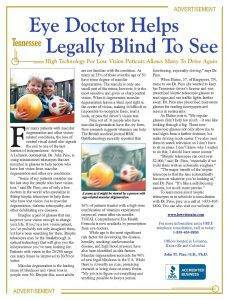 Knoxville, TN — (SBWIRE) — 02/19/2014 — Across the United States, over eleven million Americans suffer from some form of AMD (Age-Related Macular Degeneration) and that number is expected to double by the year 2050.However, to the average person on the street in Tennessee, AMD and the concept of ‘low vision’ remains a mystery.Seeking to raise awareness of this pervasive disease, Dr John Pino and the International Academy of Low Vision Specialists are focused on educating the public through ‘Low Vision Awareness Month’, which takes place in February. While it’s normal for eyesight to decline over the years, some of the leading causes of blindness in the United States such as Age Related Macular Degeneration (AMD) can be devastating for patients who receive that diagnosis. Often, patients are highly depressed when told there’s nothing that can be done, but Dr. John Pino, a Tennessee optometrist with a Ph.D. in nutrition, counsels his patients with a two-prong approach involving technology and nutrition.As an optometrist who specializes in low vision, Dr. Pino, who completed rigorous training via the International Academy of Low Vision Specialists (IALVS), recommends that patients who were told there was no hope call his office for an evaluation.